Elias Whitby was born in Yeovil in 1783, the son of John Whitby (b1755) and Hannah née Taylor. Elias Whitby was a Baptist and was baptised in 1805 at the age of 22 and became a Deacon in 1808. On 2 April 1809 he married Anna, or Hannah, Hooper and they were to have six children; Elias Jnr born 1810, John born 1811, James Hooper born 1813, Ebenezer born 1815, Joseph born 1817 and a daughter born 1819. In 1827, while building work on the new Baptist Chapel was in progress, the church congregation gathered for worship in a building owned by Messrs W & E Whitby in Frost's Yard at the corner of Vicarage Street and Middle Street. Monthly church meetings took place as usual in Elias Whitby's kitchen in Middle Street. In 1834 Messrs W & E Whitby were listed as subscribers to William Hull’s “History of the Glove Trade”. He became a successful Baptist preacher and and preached the Gospel in neighbouring villages. He was a member of Yeovil's Vestry and became a Town Commissioner in 1830 as did his brother John in 1846. Elias and Hannah lived at Townsend, or London Road, and in Elias is listed in the 1832 and 1834 Poll Books by virtue of owning freehold house in Vicarage Street. During 1837 Elias was one of the founders of the "Yeovil Coal and Potatoe Charity" with the intention of aiding the second poor of Yeovil. In the 1841 census they are listed at Townsend where Elias gave his occupation as wool stapler. He gradually prospered and became a glove manufacturer and wool dealer and his glove factory was sited where the Glovers Walk shopping precinct now stands. He was later in partnership with his sons Elias Whitby the younger and James Hooper Whitby. This partnership was dissolved by mutual consent in February 1849 and the notice was published in the London Gazette. Anna died in 1847 and in the 1851 census he was listed as a 67-year old widower living with a housekeeper at 14 Peter Street. He described his occupation as ‘Clerk of Union & Superintendent Registrar’. Elias died on 13 September 1869 at his home in Peter Street in Yeovil aged 86. For the Whitby family tree - click here. Elias Whitby's signature against the Vestry minutes of 31 December 1833. 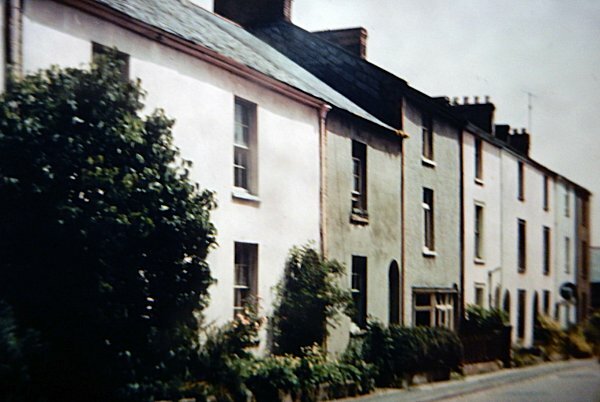 Peter Street photographed in the 1980s from the Union Street (western) end. Elias Whitby lived and died here.